These dads found a new way to bond with their babies and it's the sweetest thing you'll see today! Have you ever heard of daddy-baby dance classes? We all know that as soon as babies are born, they should be placed on their mother’s chest for immediate bonding. Have you ever considered just why that bonding is so important, though? According to research conducted by Jeannette Crenshaw, assistant professor at Texas Tech University Health Sciences Center, during the sensitive period – the first hour or so after a baby is born – a mom experiences high levels of oxytocin (the maternal reproductive hormone) which increases during skin-to-skin care. This reduces maternal and newborn stress, helps your baby transition to postnatal life and increases maternal and newborn attachment and bonding. Bonding between a parent and child, however, continues well after the sensitive period. According to Ya-Hsin Lai, PhD Researcher in Education at the University of Bath, babies need to feel this sense of attachment at birth just as a child needs it to feel safe and secure when they’re feeling sad, angry or stressed. These attachments will even help them later in life. She explains, “Children who receive this will consider themselves worthy of being loved by others. They are then able to seek support and consolation from others in the future." She therefore concludes that as parents, we should look for ways to bond with our babies, and even our older kids, to let them know that they will always have our unconditional love and support. 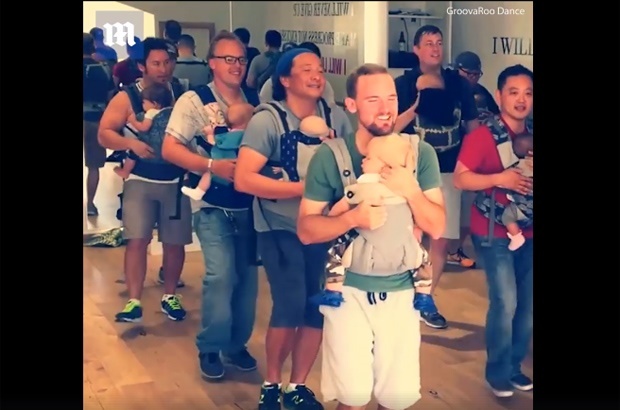 Well, while these dads may not have had that very first sensitive period moment to make skin-to-skin contact with their babies, they certainly have found a new, adorable and, dare I say, hilarious way to bond with their babies. How, you ask? Well, with daddy-baby dance class, of course. We absolutely love the idea of bonding with our babies through dance by the GroovaRoo Dance team. Have you found creative and adorable ways to bond with your babies? How about your kids and teens? Tell us by commenting below?